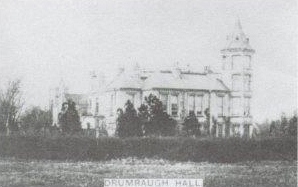 Drumrauch Hall stands on Belborough Lane, the road that leads from Hutton Rudby to the A19. It is a small hamlet these days - the Hall is divided into flats and the stables have been converted to houses. Before the Second World War it was a large country house, with a specially built music room, huge greenhouses and a walled garden. The cottages beside the road were built for the staff. It was built by the Scottish-born engineer George Young Blair as a country residence for his family. George Young Blair was born in 1826 at Drumrauch, his father’s farm near Dundee. He was apprenticed as a mechanical engineer and specialised in building marine engines – a developing industry, which he foresaw would become increasingly important. After working in Scotland for some years, he became a manager in the engineering department of Charles Palmer’s shipyard at Jarrow. He left Jarrow in 1855 to manage the Locomotive Engine Works of Messrs Fossick & Hackworth at Stockton. The firm had been established in 1840, with works at Portrack, near the Union Workhouse. Here George Blair was successful, becoming a partner in the firm after Mr Hackworth’s retirement in 1864 and then sole owner after Mr Fossick’s death not long after. “night and day, the electric light in the higher shops making them a conspicuous object for a considerable distance around”. He was entirely devoted to his work, and his obituarist clearly felt that he worked himself into an early grave. He had few problems with strikes, and even in the 1892 coal strike he was able to keep his works running. He kept clear of employers’ associations for many years, only joining the North of England Master Shipbuilders’ and Marine Engineers’ Association in about 1893, and becoming in consequence caught up in a moulders’ strike. and also as a JP for the North Riding at Stokesley. He was a Liberal in politics and great admirer of Mr Gladstone – unlike his friend Colonel Sadler who became a Conservative MP. George Blair was a Presbyterian. On coming to Stockton he attended the little Independent Chapel in West Row and contributed generously when the congregation built the St Andrew’s Presbyterian Church in Tower Street. When living at Drumrauch, he would frequently drive over to Stockton for the Sunday morning service. He was too much occupied with his business to make time to act as an elder or deacon, but was a liberal donor to funds, presented his church with a large harmonium, and in 1894 donated £200 to the new organ which replaced it. – but he disliked his generosity being publicly known. and passionately fond of music – a passion shared by his descendants. Drumrauch Hall originally had a long music room (now demolished), floored and panelled in wood, which housed a notable organ. On his death, the Blair family gave an organ to the Rudby parish church in his memory and that of his son. “close to what is now known as Brown’s Foundry”. and he kept this as his town house even after he had built Drumrauch Hall. His second wife was Margaret Borrie (1836-88). They married on 4 Sep 1862 at St Hilda’s, Middlesbrough. Margaret came from a Scottish shipping background. A Peter Borrie was the engineer who in 1834 took up building wooden steamers at the Tay Foundry, Dundee; one was the Forfarshire, which was wrecked on the Farne Islands in 1838, and whose crew were rescued by Grace Darling and her father. Borrie then moved into building iron ships until he gave up business in 1846. [The Courier (Edinburgh) 28 June 1919: a cutting kept by Winifred Blair]. Members of the Borrie family were amongst a number of Scots industrialists and engineers who moved to Middlesbrough in the mid 19th century. George and Margaret Blair had four children, one son and three daughters. Peter Borrie Blair died of typhoid in Stockton in 1891, aged 24. Mary Young Blair, known as Minnie, was born in about 1867, and married Percy Sadler, the eldest son of the industrialist Colonel (later Sir) Samuel Sadler. Florence Jean was born in about 1869, and never married. The youngest child was Margaret Amy, known as Amy, born in about 1870. She married Smollett Clerk Thomson, a Scottish bank agent, in 1899. In the late 1870s George Blair began to acquire land on Belbrough Lane, Hutton Rudby, and in about 1880 began to build his country house. In 1888 his wife Margaret died aged 52 and was buried at Hutton Rudby. Three years later in 1891, George Blair married Marian Bower. She was apparently a friend of his daughter Florence, though some 15 years her elder. Marian and her parents appear in the list of guests at Mary Blair’s wedding, a quiet affair that took place not long after Mrs Blair’s death in 1888. The third Mrs Blair was left a widow after only three years’ marriage. She lived the rest of her life at Drumrauch and died in 1943 aged 88. The family telegraphed for Dr Snowdon of Hutton Rudby to return from Ireland, where he happened to be, and specialists were called in from Newcastle and Edinburgh. However nothing could be done, and his condition gradually worsened. He died at Drumrauch Hall in the late afternoon of Saturday 22 September. He had asked for a quiet private funeral with no flowers, but naturally a large number of people wished to attend. Blair & Co was closed for the day, and many workmen came to Hutton Rudby for the service. The Presbyterian minister from Stockton held a service at Drumrauch Hall, which was attended by family, immediate friends, and prominent members of St Andrew’s, Stockton. Then all the officials and many of the workmen of Blair & Co began the walk to the church, followed by the hearse carrying the heavy oak coffin with its massive brass mountings. Then came the carriages of the chief mourners: Percy Sadler-Blair and George’s brother-in-law Peter Borrie and his sons; and then followed the close friends: Colonel Sadler, Sir Raylton Dixon, Mr Wrightson MP, his neighbour Mr Richardson MP, Colonel Ropner, Mr C A Head, and Mr R H Appleton. They passed through the village, where every blind was drawn in sympathy, and were met at the parish church by the vicar Mr Johnson and the Revd Kyle. Hundreds of people attended the burial – workmen, neighbours, Teesside industrialists, and men from Edinburgh, Newcastle, Liverpool, and Greenock. Between 1875 and 1877 George Young Blair bought land for his country house on the north side of Belbrough Lane. The site he chose is on the edge of Toft Hill (geologically, a drumlin) with wide and beautiful views across to the Cleveland Hills. The nearest large house was the Vicarage, built by the Revd Robert Barlow in 1844 on glebe land beside the road connecting Hutton Rudby church to the chapel at East Rounton, which was then part of his parish. At a further distance stood Potto Hall, where George Copley and his wife lived in some grandeur – the 1871 census shows a large staff, including a butler, housekeeper, housemaids, laundress, kitchenmaids etc. After Copley’s death in 1878 the Hall was bought by the Quaker Joseph Richardson. On 10 March 1875, Blair bought three parcels of land from the estate of William Jackson deceased, whose exectutors were Sarah Jackson, his widow, now of Darlington, and Stephen Hoggart, farmer of Bilsdale. Jackson's sons, John Thomas and Bennison Jackson, who would have inherited from their father, had emigrated to America in the very month in which he died, and there they themselves died the following spring – John in hospital in Houston, and Bennison in hospital in Galveston. Both young men were under 21 years of age, and unmarried. Mrs Jackson and Stephen Hoggart sold the land to Blair for £800. This consisted of Jakebarn, a farmhouse and garth which Jackson had bought from Michael Sidgwick, one field which he had purchased from William Whorlton, and two fields, acquired from George Jackson. Some of the outbuildings now standing seem to pre-date the Hall and must derive from this time. (1) 1 acre, known as Jakebarn, which had been occupied by Ann Shepherd, then Thomas Longthorn, and most recently by Sarah Jackson. It was bounded on the east by land also sold to Blair, on the west and north by land belonging to the Governors of Queen Anne’s Bounty (the government body that supplemented the salaries of poor clergy), and on the south by the road to Rounton. (2) 3 acres 2 roods 13 perches, bounded on the east by land belonging to Queen Anne’s Bounty, on the north and west by land belonging to Joseph Richardson, and on the south by the road to Rounton. (3) 2 acres 1 rood 30 perches, formerly part of a close called Gyles’ Ground, bounded on the east by land which had belonged to James Pennyman Bt., and now belonged to Joseph Richardson, on the west by Jakebarn (1), on the north by part of a close called Gyles’ Close, and on the south by the road. This land had previously belonged to the Whorltons, Longthorns and then William Jackson. On 10 January 1877, Blair bought for £500 2 acres 2 roods and 2 perches of land, formerly part of Gyles Ground, from William Forster, farmer of Lealholm Bridge, and Robert Forster, miller at Bishopton, Co Durham (the executors of their brother Thomas). The land was bounded on the north-east by land belonging to Joseph Richardson, on the south-east by Mr Blair’s own property, on the south-west by the Ecclesiastical Commission, and on the north-west by land belonging to Joseph Richardson. On 16 May 1877, Mr Blair bought for £600 2 acres and 2 roods of land, which was part of the glebe land known as Jacques Barn, from the vicar, Mr Barlow, the Ecclesiastical Commissioners and with the approval of the patron of the living, the Rt Hon Lucius Bentinck Cary, Viscount Falkland. It was bounded to the north-east by Mr Blair’s own property, on the south-east by Belbrough Lane, on the south-west by Mr Blair’s land, and on the north-west by Joseph Richardson’s. It is not clear from the 1838 Tithe Map exactly which fields were involved, but it seems most probable that Mr Blair was able to buy land which made his holding into the square block, which can still be seen by its border of trees. He also owned Toft Hill farm (100 acres), Gardenstone Farm (95 acres) and Linden Grove (97 acres). He owned the shop rented by Thomas Barthram on North Side, Hutton Rudby, and had money out on mortgages throughout Teesside, and in the Croydon area. By mid-May 1877 George Blair had bought all the land he needed for his country house. The architect’s plans, preparation of the site and the demolition of the existing farmhouse must have taken time. The date of the Hall’s completion is not known, but work is thought to have been started in or after 1880. The Hall was named, according to Blair’s obituary, after his father’s farm near Dundee where he had spent his childhood. The Blair family became part of village life soon after the land was purchased. In the autumn of 1878 they took part in planting the trees on the village green. Master Borrie Blair, who must then have been about eleven years old, planted a lime on the corner near North Side, opposite Milburns, and his younger sisters planted another lime near Hutton House. This latter might be the tree which now has a seat beside it, dedicated to Peggy Stephens. It seems from George Young Blair’s obituary that the Hall was his “country residence” and he kept his Stockton town-house near to his works. His family may have spent more time at Drumrauch, but for several years their timetable must have been affected by the requirements of the children’s education. The only boy, Peter Borrie, may have been sent away to school, but the girls could have been educated either at a “ladies’ academy” in Stockton or by a governess at home. Certainly on census night Sunday 3 April 1881 most of the family were at 149 High Street, Stockton. George Blair is there described as 57 years of age, a JP, engineer and managing director of Blair & Co, employing 1,560 men and 320 boys. His daughters Mary 13, Florence 12 and Margaret 10 are in the house, with his mother-in-law Jean Borrie, an “engine builder’s” widow aged 77, and her unmarried daughter Janet 38. There were three female servants – a cook, a 19 year old Irish nurse, and the housemaid Esther Braithwaite, the 22 year old daughter of a Hutton Rudby tailor. Mrs Blair and their son are not present. It is possible that a badly transcribed entry on the 1881 CD-Rom for the St Enoch Hotel, Glasgow, records their presence: Mrs Mary Blair aged 45, born Dundee, merchant’s wife, and ‘P Boreg Blair’ aged 14, born in England. By the next census, taken on the night of Sunday 5 April 1891, Mrs Blair had been dead for three years and her son Peter had died only two months earlier. At Drumrauch Hall that evening were: Florence 22, Margaret 20, and Mary Sadler with her husband Percy and their baby Winifred, who was five months old and had been born in Hutton Rudby. There were two cooks, a kitchenmaid, a nursemaid and a visitor called Lily Froade, a 22 year old hospital nurse born in Dublin. This was the year of George Blair’s remarriage – he is not at the Hall for the census, but may have been in Stockton. In the cottages were the families of the coachman Robert Elgie, who had five children, and the gardener John Ornsby, who had four. The land on which the Hall was built covered about 13 acres. The development of the site can be seen in the Ordnance Survey maps of 1893 and 1914. The 1893 map shows the roadside cottages, ‘Crystal Cottage’ and the Hall – the stable block was evidently not yet built, but there must have been stabling in the line of buildings shown on the site of the present-day garages. The Hall was then considerably larger, with a long wing extending away from the road. At a right-angle to the wing and facing towards the hills, a complex of buildings is shown cross-hatched. These appear to be conservatories, possibly a Winter Garden, stretching across as far as the boundary between ‘White Lodge’ and ‘Holywell House’. In the angle between the Hall and the conservatories was an expanse of lawn, bordered by paths winding through shrubberies; the driveway to White Lodge follows the original line of the path. Visitors approached the Hall through the sandstone gate pillars; the outoffices and stables seem to have been screened from their view by a wall. The tradesmen’s entrance was along another drive, between the cottages and the present Christmas tree field. The drive made a sharp turn immediately behind the cottage – the “protector” stone that saved the lower courses of brick from damage by cart wheels is still there, but higher up the brickwork was chipped by vehicles taking the tight corner. The 1914 map shows some alterations to the gardens and to the building which then stood between ‘Crystal Cottage’ and the now demolished wing of the Hall. The tradesmen’s entrance now ran closely around the recently built stable block – the brickwork on the corner of ‘Westfield’, now hidden by climbing roses, shows considerable damage from turning carts. The stable yard is drawn in such a way as to suggest that it may have had a glass roof, as legend insists. Both maps show a pump in the yard, apparently near the kitchens. There are several other plans of Drumrauch in existence. One, described to me by Simon Whitfield, showed the fields now planted with Christmas trees as “Drumrauch Polo Fields.” There is a clear and detailed plan attached to a 1946 Conveyance on which are marked the kitchen garden, the rose garden (this last may have been what is described by Dr Bennett’s daughter as the walled garden) and the three staff cottages – two on the roadside, and the cottage in the stable block now known as ‘Paddock Cottage’, but then called Ward’s Cottage. Even now there are still people who remember the large glasshouses at Drumrauch, with steep pitched roofs, heated by a system of pipes. The Drumrauch gardener grew vines, and until quite recently there were still villagers who could remember buying grapes, figs and peaches here. In the demolished wing was the long music room. When major alterations were done to the Church in 1924, villagers were ferried by bus to services held here. The original fittings of some of the stables can still be seen, but the tall doorway from the stableyard into what is now ‘Westfield’ is partly bricked in – it was previously high enough for a mounted rider to enter. The stable clock disappeared from above the archway after 1946 – it had been much valued by people working in the fields nearby as it could be heard clearly striking the hour. The late Les Charlton of South Side could remember the smooth lawns, which his grandfather mowed with a pony-drawn mower – the pony wore canvas boots to prevent damage to the turf. The Hall’s most distinguishing feature is its tower. Towers must have been something of a local fashion at the time – at least three of Mr Blair’s friends had one. 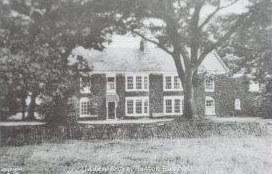 Mr Bowes Wilson added one to Hutton House on the village green, while in Eaglescliffe the houses of both Colonel Sadler and Mr Appleton had towers. Sadler’s tower at ‘Southlands’ was square, but old photographs show the tower at Richard Henry Appleton’s Woodside Hall bore a distinct resemblance to Drumrauch’s, though perhaps more elaborate and built on a grander scale. Mr Appleton of Cleveland Mills was Mayor of Stockton; Woodside Hall was built in 1876, thus pre-dating Drumrauch. It was demolished in 1970, and Teesside High School now stands on its site. Appleton and Blair will have known each other well, and Mr Appleton appears in the list of mourners at Mr Blair’s funeral. Both were believed locally to have used their towers to keep an eye on their workmen. A continuing source of fascination at Drumrauch is the underground network of pipes and drains. The picture is complicated by the existence of some features which must pre-date the Hall – the disused well which was found immediately behind ‘Westfield’ is one example. The system of large septic tanks, beautifully built of brick, is still in current use, but the heating system remains something of a mystery. Residents know of two large underground water tanks complete with pipes, one in the Hall car park and the other in the garden of ‘Crystal Cottage’. One of the red brick outbuildings belonging to ‘Crystal Cottage’ is said to have housed some sort of boiler or engine from which large pipes ran, a cut having been made into the outside wall for the purpose. Certainly there are suggestive alterations to its brickwork which can be seen from the garden of ‘Westfield’. It seems very likely that a system of hot water pipes heated the house and conservatories, and possibly even the walled garden. I have been told of a Victorian walled garden elsewhere which was heated from outside by huge hot water pipes (marked, my informant believed, “Blair & Co”) to create a micro-climate within. We assume that the Hall had a cellar (Eden Cottage, also owned by the Blairs, certainly has one) and one of the residents of the Hall has recently  discovered what he believes to be its entrance. A notable feature of Drumrauch still is the little wooden chalet with a slate roof from which ‘Crystal Cottage’ takes its name. There were once many photographs of the Hall as the family developed a passion for photography. A great number of photographic plates were still to be found in outbuildings at Drumrauch in 1950, but are believed to have been destroyed during the building work carried out by Messrs Robinson. Blair died leaving his widow, aged about forty, and his three daughters, who were in their mid-twenties. His Will, dated 29 March 1893, appointed J Stothart, (or Stoddart) bank manager of Stockton, Walter Nichol, bank manager of West Hartlepool, and James Bell Stothart (or Stoddart), solicitor of Lincoln’s Inn Fields, to be his Executors and Trustees. He left some annuities and legacies, and the Hall, with its 13 acres of land, cottages, stables, coachhouse, conservatories, greenhouses, etc was left to his widow and daughters, for so long as two of them wished to remain living there. If Mrs Blair wished to live elsewhere a residence at a rent not exceeding £40 a year was to be provided. The residue of the property was in trust for his wife and children, each child taking a share twice the size of Mrs Blair’s, who was to take only the income from her share during her life. The personalty of the estate (that is, not including the houses and farms) was valued at £88,648-18s-2d. Mrs Blair spent the rest of her life at Drumrauch. She died on 13 Feb 1943, aged 88. A member of her family recently  called at the Hall when visiting from the USA, a descendent of her niece Helen Mabel Harmsworth who was married from Drumrauch. Helen and her brother had been brought up by Marian’s sister Helen Cooper and her husband Henry, after the death of their mother. The family believes that Winston Churchill visited Drumrauch at some point in the War, when the Hall was requisitioned by the Army. The bride wore Irish poplin trimmed with pearls and crepe de chine, with “an ample train”, a wreath of orange blossoms and a long tulle veil. She carried a bouquet of stephanotis and tuberoses, and “wore no ornaments”. Her bridesmaids were her sisters, Florence and Amy, who wore white china silk with Directoire hats to match, and carried a basket of white swell peas and maiden-hair fern. “When they passed the village green [after the service] the school children heartily cheered them, and fresh showers of rice were thrown while the Hutton Rudby Brass Band played the “Wedding March”. Percy Sadler took the name Blair and became managing director of Blair & Co after his father-in-law’s death in 1894. He and Mary lived for a short time in Eaglescliffe, where his parents had their family home at ‘Southlands’, in The Avenue. They then moved to Linden Grove at Hutton Rudby, a house previously occupied by the Hartlepool shipowner T E Pyman. George Blair had bought the house, which Mary took as part of her share under his Will. Earlier in the century it had been called Suggitt Grove, but the lime tree avenue inspired a more romantic name. Mary and Percy made many alterations to the house, changing its aspect to face Roseberry Topping and employing local craftsmen to fit the hall with fine wooden panelling in 1896. Percy was a member of the village cricket team in 1890 and 1891. He died aged forty in 1906. Mary died in December 1935 after a few months’ illness, aged 68. The Darlington & Stockton Times of 7 Dec 1935 recorded the “Passing of Mrs Percy Blair – Friend and Benefactor of Hutton Rudby”. She had been “a liberal supporter of all local organisations”. She is remembered for little acts of kindness such as allowing the village children to play in the field which the Parish Council wanted for many years to use as a play area, sending the maids out to walk in the shrubbery to enjoy the rhododendrons when they were in bloom, and allowing children to skate on the pond at Linden after 4 o’clock. The present occupants of Eden Cottage possess photographs of people playing tennis there, whose identity is unknown, but who may be Blairs. The previous occupants were the family of John Thormann, iron and steel merchant. A Robert Thormann had been manager of Fossick & Hackworth when George Blair came to Stockton, and Blair had succeeded to the post on Thormann’s death. Mr J J Thorman and Mr W Thorman came to Mr Blair’s funeral, and descendants of the family still appear from time to time to revisit the house. Villagers still remember a caravan in the field next to Eden Cottage, where one of the Misses Blair lived when she had scarlet fever, to isolate her and contain the infection. “son of the late Mr Thomas Thomson, Edinburgh. Mr Thomson is sub-agent at Leith for the British Linen Company’s Bank ... Flags floated on the Hall, and at intervals along the road to the old-fashioned church of All Saints’ lines of gaily-coloured streamers were suspended between the trees”. The bride wore white satin trimmed with Honiton lace and a veil of Honiton lace, and was followed by seven bridesmaids, including her sister Florence and her nieces Winifred and Margaret Blair, while her nephew George Blair, wearing a kilt, carried the train. The bride and groom were to live near Edinburgh. Amy Thomson died only a few years later in 1907, aged 36, and her husband in 1915 aged 53. They left two orphaned children, Monica Margaret Amy and Alastair Blair Smollett, who was to become a barrister. In the newspaper account of Alastair’s marriage in June 1927 he is described as Mrs Blair’s nephew, which suggests that she played a major part in his upbringing. The wedding was in Yarm Parish church, and the bride was Beatrice Margaret, second daughter of Mrs Walton and the late John T Walton of The Mount, Yarm. Percy and Mary Blair had several children, baptised at Hutton Rudby: Winifred, Margaret, George, Katharine and Marian, and a son who died in infancy. They grew up at Linden Grove, which photographs of the 1890s show was then covered in creepers. In some photographs a bird table or small dovecote can be seen situated strategically outside the nursery window. Private theatricals were enjoyed by the Blair family for many years – Winifred also kept the programme for an outdoor production of A Midsummer’s Night’s Dream in Linden Grove Garden in August 1912. It was in aid of The Fresh Air Fund (seats 1/-, tea 1/-) and the cast again included Winifred and George Blair. The family were also fond of sport – their father Percy had played village cricket and Winifred’s scrap books contain the notice of “An American Lawn Tennis Tournament at Linden, Hutton Rudby, and neighbouring courts” in August 1925, in aid of St Dunstan’s. Winifred was the eldest, born in 1891. She never married, and her scrap books show her love of the theatre, both amateur and professional, of Shakespeare, music, rugby and cricket, and the Lake District. She was active in many voluntary and charitable works – the Primrose League, the Paste Egg Show, the wartime Waste Paper Collection etc – and particularly kept cuttings from the WI drama competitions, in which she was involved and keenly interested. She is described as of Toft Hill Farm in a cutting about ploughing competitions in 1923. She kept many cuttings relating to her Sadler grandparents, uncles and cousins. She died aged 60 in 1951. Margaret Florence was born in 1892 and died in 1901 aged nine; her ghost, mischievous but harmless, is still seen  at Linden, playing with stereo, TV and objects on the dressing-tables. George Young Blair was born in 1894, and killed in the War in 1915. Katharine Mary Blair was born in 1897. She married Lieut Felix Temperley Roche, RN, HM Submarines, on 26 Feb 1918. He was the youngest son of the late Wilson M Roche of Sunderland, and Mrs Roche of Riding Mill. She was said locally to have left him behind in Africa – “at least we never saw him again!” In fact, he died in Johannesburg. They had three children: George Campbell Adair Roche, who was killed in the Second War; Daphne, who married one of Lady Dorman’s sons by her first marriage, and so became Daphne Webster; and Susan, who became a nun. Maurice H Jones was still alive in 1946, when he was a Trustee of the estate of George Young Blair with S A Sadler. Samuel Alexander Sadler (1842-1911) was one of Teesside’s industrial giants. He was born in 1842, the son of a Staffordshire gentleman, and studied at London University under the celebrated chemist Michael Faraday. He worked for a time in the Midlands before coming to Middlesbrough in 1862. In 1869 he established his works in Cargo Fleet Road and from this 30 acre site Sadler & Co became a major chemical manufacturer, distilling tar and manufacturing alizrine and aniline colours. Samuel Sadler lived at first in Ormesby, moving to Eaglescliffe in the mid-1870s after the death of his first wife and two daughters. He built the elegant Italianate ‘Southlands Villa’ in The Avenue – like Drumrauch, it has a four-storey tower. He was active in local politics, three times Mayor of Middlesbrough, and in 1900 became its first Conservative MP. He sat as a magistrate for Middlesbrough, County Durham and the North Riding, was the first chairman of the Tees Port Sanitary Authority, a River Tees Commissioner for over thirty years, a member of the Tees Valley Water Board, and Yorkshire’s representative on the Sea Fisheries Board. He was a Lieutenant-Colonel of the Volunteer Brigade of the Durham Light Infantry, master of the Lodge of Freemasons and rode with the Hurworth Hunt. A larger than life character known for his generosity, he was knighted in 1905 and died in 1911. His statue stands near Middlesbrough Town Hall. His eldest surviving son, Cecil James Sadler, became chairman of the company, and on his death in 1936 was succeeded by Sir Samuel’s half-brother Stanley, who died in 1950. There are Sadlers amongst Mary Blair’s Marriage Settlement trustees and the trustees of her father’s Will. Ward’s Directory 1914-15 shows Stanley Sadler living at ‘Eastleigh’, Yarm Road, Eaglescliffe, and Lady Sadler living nearby at ‘Southlands’, The Avenue. Winifred Blair’s scrapbooks contain cuttings about her uncles Gerard Gloag Sadler, killed in the First War, and Hereward Sadler, Lt Col 6th Dragoon Guards, and photographs of Lady Sadler’s 80th birthday celebrations. Members of the Sadler family afterwards lived at Linden Grove. At the end of the First War, after Florence’s death, the land belonging to the Executors of G Y Blair remained the same, but Florence’s property had passed to her sister Mary. The Deeds show that there were several changes of the Executors and Trustees of George Young Blair’s estate. On 1 August 1904, Percy Blair became a trustee. He died aged 40 on 23 December 1906, and on 7 June 1907 the trustees were Walter Nichol, Cecil James Sadler, colliery owner of Oswald House, City of Durham, and Smollett Clerk Thompson, bank agent of Midlothian. In 1921 Borrie was discharged as a trustee and Felix Temperley Roche took his place. Roche died in Johannesburg in 1928, and Alastair Blair Smollett Thompson, barrister, was appointed. The Hall remained in the Blair family until after the death of Mrs Blair. At some point there was an accident at the Hall which is still remembered in the village, when a man who was painting the outside woodwork was killed by a fall from the tower. During the Second War the Army requisitioned the Hall (they also took over Hutton House and Skutterskelfe Hall). Finally, on 29 September 1946, the trustees, S A Sadler of Danby Lodge, Danby, M H Jones, and A B S Thompson sold the Hall to Miss Jessie Harrison and Miss Dorothy Doidge, both of 10 Banks Terrace, Croft, for £4,500. It then comprised 11.996 acres. In December 1948 the Hall was considered by Middlesbrough Town Council as a possible place for the provision of after-care for mothers and young children – it was evidently not found suitable for the purpose, perhaps because it was in poor repair and would have been expensive to maintain. Miss Harrison and Miss Doidge mortgaged the Hall, and in May 1950 Miss Doidge sold Miss Harrison her share. At this time they are both still described as being of 10 Banks Terrace. Miss Harrison was living in the Hall when Dr Bennett and his family came, in 1949 or 1950, to rent a first floor flat in what is now Crystal Cottage. Dr Bennett was to take over Dr Proctor’s practice – Dr Proctor was still living at Eden Cottage, and there was nowhere in the village for the family to live. Tarrans of Hutton Rudby were building Wynd House for them, but because of the shortages of materials after the War this took two years to complete. Crystal Cottage was at that time a building with garages and store rooms below, and a Billiard Room, Card Room and Dark Room above. The family had to go to the Bungalow on Belbrough Lane or the Vicarage for a bath. It must have been very hard work for Mrs Bennett, who had a baby while living here and was to die at the age of 45, but for the children it was idyllic. They ran wild amongst the fields, ponds and pigeon loft (where they got stuck when the ladder fell down, leaving them choking in the dust), and played with Olwyn and Amy Ward, who lived in the cottages. They had the run of the Hall, and used to play there, frightening each other with ghost stories and taking their sewing up to the tower. Amy remembered that there was a door from Ward’s cottage into the stable yard (now presumably the coal shed for Drumrauch South), and remembered seeing old Mrs Blair in the Hall. Maureen Graham remembers visiting Drumrauch Hall as a teenager when the Thompsons, who later moved to the Pump House, Skutterskelfe, lived there. The Hall was semi-derelict, with a snooker table in the hall. The family kept lots of dogs and they were exercised on the roof, where there was an area fenced about with railings (railings can be seen on the photograph of the Hall). A few months after the Bennetts’ arrival, Miss Harrison sold the property to Messrs Arthur Robinson Ltd of 423 Linthorpe Road, Middlesbrough, and the demolition work began. Between 1950 and 1962 Messrs Arthur Robinson sold off Crystal Cottage, with 10 acres, to Gwendoline Coulthard; one cottage at the front, to Joseph and Mary Liverseed of Sexhow Grange; a piece of drive and a garage to Amisons, of The Bungalow; and the White Lodge site, in two pieces, to T P Allen. They also sold off ‘Westfield’, the Bungalow itself (which is presumably what is now called Drumrauch South), and Stables Cottage, but no memoranda are endorsed on the Deeds to the freehold to this effect. (The sale to Coulthard included land down to the road, which appears now to be the site of Holywell House). On 3 April 1962, Robinsons sold Flat 1 and part of the garden next to the road, and a garage, to A E Evans. This Deed was later lost at O’Rourkes, Solicitors. It appears to have contained provisions about granting subsequent leases from the rest of the property, and management of the flats. On 16 October 1963, Mr and Mrs Evans bought up the rest of the property, including the garages, main drive, the drive up to Stables Cottage, the little yard where Harold Barker of Drumrauch Cottages used to park his car, and Wards Cottage. This last was sold off in 1964 to D R Hemmingfield Ltd. Presumably Robinsons had intended to establish the Hall as a block of flats with a proper management company for the upkeep of the fabric of the building, and it is because this was never completed that problems persist today. From this point matters became more confused, with lost and poorly drafted Deeds. The Evans mortgaged the land in 1969, but the charge, according to the plan on the Deed, did not include the strip of garden by the road, which the Evans had bought in their original purchase. The sale on to the Gibbs in 1972 referred to the plan on the Mortgage Deed, and so Mr Gibb in 1984 had to make a Statutory Declaration as to undisturbed possession of the garden to establish his right to it. There is a further discrepancy in the Deeds, in that the 1963 Conveyance includes the little chalet, and excludes the archway and the corner garage. The 1984 Declaration excludes the chalet, which must have been sold off, and the middle garage (which now belongs to Drumrauch South) but includes the archway and the corner garage – perhaps they had done a swap? And no plan I have seen so far shows the ownership of the bit of stable yard by the pump and mounting block. Mr and Mrs Gibb bought on 29 August 1972, and in 1986 granted three 99 year leases – Flat 3 (ground floor) to Whitehead, Flat 5 (first floor) to their daughter, and Flat 5 (first floor) to Jenkins. In Rudby parish church the west window is dedicated to the memory of Mary Young Blair. Nearby is a brass plaque in memory of her son, 2nd Lt. George Young Blair, who is also commemorated on the tablet listing the village dead of the First World War. Outside, in the churchyard, near the east end of the church are the graves of the Blair family.